Buckingham Palace officials said on Wednesday night that Queen Elizabeth II's visit, which had been set for Thursday, will be postponed. Chinese Premier Li Keqiang says the terrorist attack outside the British Parliament in London was the first subject of discussion when he met with Prime Minister Malcolm Turnbull of Australia on Thursday morning in Canberra. Li says that "together, we send our condolences to the prime minister of the U.K. and together we condemn terrorism and we stand against all forms of terrorism." The Chinese leader says that "there cannot be continued instability in the world," adding: "We must cherish peace and stability." New Zealand's prime minister is condemning the attack outside Britain's Parliament that resulted in five deaths, including the assailant. Prime Minister Bill English told reporters in Rotorua that he has written to British Prime Minister Theresa May to express support for her government and to offer his country's condolences to the victim's families. 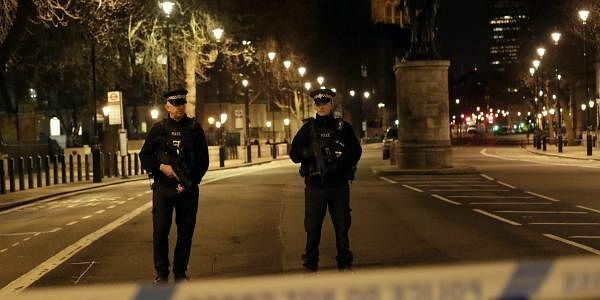 A knife-wielding man went on the deadly rampage in the heart of Britain's seat of power Wednesday, plowing a car into pedestrians on London's Westminster Bridge before stabbing a police officer to death inside the gates of Parliament. Other officers fatally shot the attacker. In addition to the dead, 40 people have injuries. May has condemned the incident as a "sick and depraved terrorist attack." South Korea's Foreign Ministry says five South Koreans in their 50s and 60s were among the 40 people injured in London during the terror attack outside Parliament. The ministry says the five were hurt when they were caught up in a stampede of people trying to escape the attack. It says four of the South Koreans suffered broken bones and other injuries and a woman in her late 60s needed an operation to treat a head injury. Buckingham Palace officials say Queen Elizabeth II will postpone plans to open the new Scotland Yard headquarters. The palace said on Wednesday night that the queen's visit, which had been set for Thursday, will be postponed. The change is due to security concerns raised by the terror attack on Parliament. It is also expected that police will be involved with a major investigation that will occupy many officers. The queen was to have been joined by her husband Prince Philip at the official opening of the new building. Australian Prime Minister Malcolm Turnbull says the police presence at the Australian Parliament House has been increased in response to the London attacks. "Australia's heartfelt sympathy and resolute solidarity is with the people of the United Kingdom with whom we stand today as we always have in freedom's cause. Staunch allies in the war against terrorism," Turnbull told reporters on Thursday. "The attack on the British Parliament is an attack on parliaments, freedom and democracy everywhere," he added. The Eiffel Tower is going dark in mourning and solidarity with Britain after an attack around the British Parliament in which four people, including the attacker, were killed. Paris Mayor Anne Hidalgo, whose city has suffered deadly extremist attacks in recent years, announced that the tower is turning off its twinkling lights at midnight (2300 GMT). Three French teenagers on a school trip were among those injured in Wednesday's attack targeting pedestrians on London's Westminster Bridge and a police officer on the nearby Parliament grounds. French President Francois Hollande offered support for Britain and the investigation. Prime Minister Theresa May has condemned the "sick and depraved terrorist attack" in London and says the targeting Parliament was no accident. In a late-night statement outside her Downing Street office Wednesday, a defiant May said the nation will not give in to terror and those who targeted the seat of power in Britain. She insisted that "tomorrow morning Parliament will meet as normal," and urged the country to move on and behave as normal on Thursday. May says "we will all move forward together, never giving in to terror and never allowing the voices of hate and evil to drive us apart." The prime minister confirmed that four people died in the attack and praised the security services who ran toward danger. A French government plane is set to fly to London Wednesday evening to bring the families of three French students wounded in the attacks at the British Parliament to their loved ones. French President Francois Hollande announced the move in a statement Wednesday night after speaking with British Prime Minister Theresa May. May confirmed to Hollande that three French high school students from France's western Britanny region were wounded in the attacks, the statement said. Hollande offered his condolences to May for those who died in the attacks and expressed France's solidarity with Britain "in this tragic ordeal." "The British and French services are in close contact to conduct the investigation," Hollande added. Romania's foreign ministry says two Romanians were wounded in a deadly attack in London's Westminster that left four dead. The ministry said the two had been taken to a hospital for treatment. There were no further details on the identity of the two or how seriously they were injured. The ministry said it had been informed by authorities in London. A knife-wielding man went on a deadly rampage near the Parliament, mowing down pedestrians on London's Westminster Bridge before stabbing an armed police officer to death inside the gates of Parliament. Four people were killed, including the attacker. About 20 others were injured.